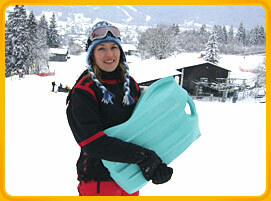 The Zipflracer was designer in the winter sport mecca of Garmisch and is being produced in Bavaria, Germany. The original model was based on coal shovels used by ski-lift workers to slide downhill after their shift was over. The Zipflracer’s dynamic new design is not only ergonomically advanced but offers its users better controls as well as a safer and more comfortable way to ride.